The Breaffy man will bring up his century tomorrow evening. Aidan O'Shea will make his 100th appearance for Mayo on Saturday. MAYO HAVE MADE just one change from the side that overcame Clare earlier this month as they prepare to face Cork in their All-Ireland Senior Football Championship Round 4A qualifier tomorrow [Sky Sports, 5pm]. Tom Parsons replaces Donal Vaughan in midfield, the Charlestown player having fully recovered from the flu bug that kept him out of the win over the Banner. 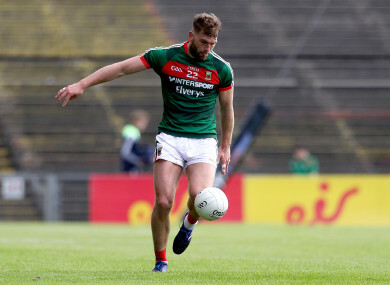 This weekend will also mark Aidan O’Shea’s 100th Mayo appearance – 46 in the championship and 54 in the league — since making his debut against New York in 2009. Throw-in at the Gaelic Grounds is at 5pm. Email “100 not out for O'Shea as Mayo name XV for Cork”. Feedback on “100 not out for O'Shea as Mayo name XV for Cork”.